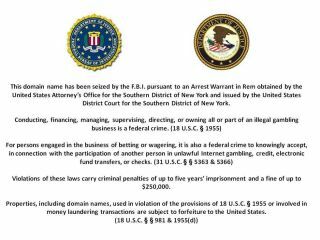 Three of the world's biggest online poker sites have been shut down by the FBI on charges of fraud and money laundering. Executives from PokerStars, the biggest poker site in the world, Full Tilt Poker and Absolute Poker have been arrested and all three sites have been taken down. A law was brought into effect in the US in 2006, which made it illegal for banks and credit card companies to transfer funds to online gambling sites, although the gambling itself was still allowed. This law and how poker sites have got around it form the crux of the legal matter. "These defendants concocted an elaborate criminal fraud scheme, alternately tricking some U.S. banks and effectively bribing others to assure the continued flow of billions in illegal gambling profits," said Preet Bharara, US attorney, in a statement. All three of the sites have been taken down and replaced with an FBI notice which reads, "This domain name has been seized by the FBI pursuant to an Arrest Warrant." It goes on to say that being involved in the owning or running of 'an illegal gambling business' is a federal crime, as is accepting funds from and between gamblers. "Violations of these laws," concludes the notice, "carry criminal penalties of up to five years' imprisonment and a fine of up to $250,000." According to a report in the LA Times, prosecutors are looking to shut the sites down entirely and recover around $3 billion from the companies. Users of the poker sites are, understandably, concerned about any money they had stored in their accounts on the sites, and there's no clarity yet on whether they will get access to the funds. Full Tilt Poker, which is now based in Dublin, has released a statement of saying that it "must suspend 'real money' play in the United States until this case is resolved. However, Full Tilt Poker will continue to provide peer-to-peer online poker services outside of the United States." But not until its website is restored, presumably. "Mr. Bitar and Full Tilt Poker believe online poker is legal – a position also taken by some of the best legal minds in the United States. Full Tilt Poker is, and has always been committed to preserving the integrity of the game and abiding by the law." Bitar added, "I am surprised and disappointed by the government's decision to bring these charges. I look forward to Mr. Burtnick's and my exoneration."